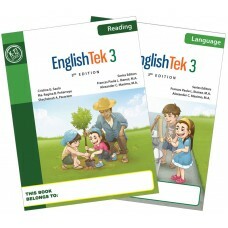 EnglishTek 1-6 prepares learners to be effective communicators and use language in both social and academic settings. The program features a spiral curriculum to facilitate the mastery of language competencies. Each lesson is centered on a communicative theme to showcase how language is used in social situations. The Reading volume features directed reading activity that aims to develop the love for reading. Activities help learners navigate difficult words, search for context clues, and test their comprehension. Each selection is adapted to match the age and reading level of learners. The Language volume features model texts that showcase the variety of ways language is used and discusses grammar topics using visual explanations and links grammar rules with linguistic functions. Each lesson also contains a variety of assessment activities that is aimed towards developing higher order thinking skills. Learners also get access to the EnglishTek learner's website that features games and interactive exercises that develop and test their grasp of language, vocabulary, and reading skills. They also get access to the downloadable Virtual Dialog client that develops conversation skills through speech recognition. This product is priced and configured for individual buyer purposes. If you represent an institution and would like to purchase bulk orders of our titles, kindly please contact us or email support@techfactors.com.